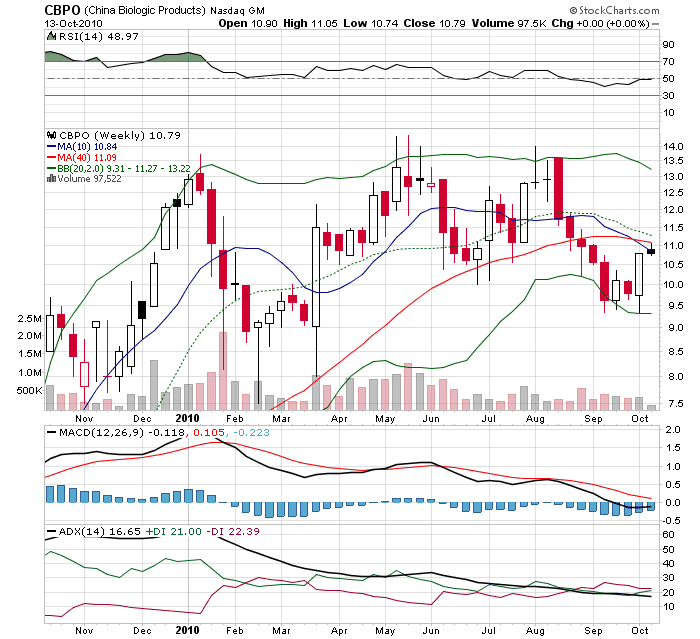 Good value and good growth -- would you believe a smallcap Chinese biotech? The fact that it was on the Ebb and Flow Report means that on the weekly chart the company seemed to be undergoing an upside reversal. The report also showed that the company's Price to Free Cash Flow and Cash Flow Yield were both attractive, it's PEG was a mere 0.2 and Price to Sales suggested the stock was somewhat of a bargain at the current price. Here is the weekly chart upon which the Ebb and Flow Report BUY signal was based. You can see the bounce off the lower Bollinger Band which contributed to the signal. 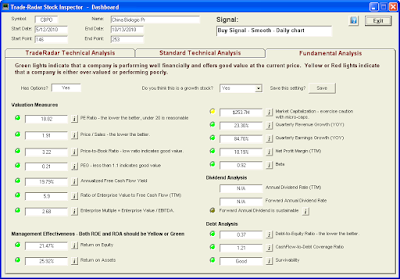 Looking to dig deeper into the financials, I entered the symbol into the Trade-Radar Stock Inspector software and checked the Fundamental Analysis tab on the Dashboard. Every single LED was green except the one for Market Cap. At only $258 million, the diminutive market cap causes a yellow caution light to come on. I very seldom see stocks that can light almost every single LED green. The significance is that it means the company shows value at the current price, is effectively managed, is undergoing growth, is not over-indebted and has good margins. 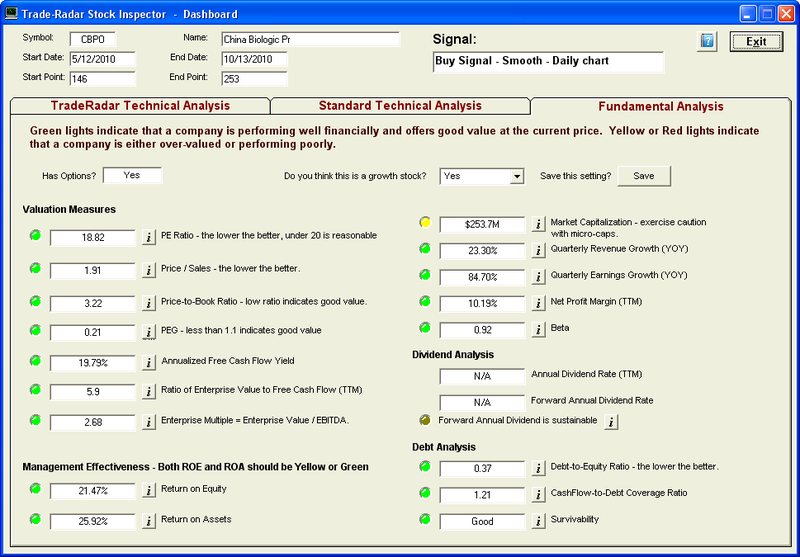 Enterprise Multiple - this is a commonly found measure on many sites and is a ratio of Enterprise Value/EBITDA. I have to draw your attention to this number because, at only 2.68, this measure suggests that China Biologics is way, way deep in value stock territory. The company doesn't have much debt but another of the unique evaluations the software provides is the Cash Flow to Debt Coverage ratio and Survivability. Both of these values indicate the company is far from being over-extended in terms of debt. With respect to growth, the following chart from Google Finance shows how the last two quarters have shown rapid growth on both the top-line and bottom-line. Year-over-year growth and margins have improved as well. This chart shows year-over-year revenue growth of 23% and quarterly earnings growth of 84%. 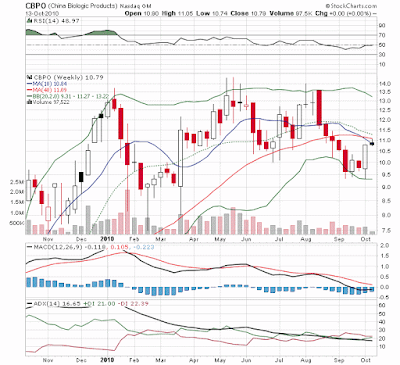 Some classify CBPO as a biotech but actually it is a biopharmaceutical company. As such, there is less risk of management having to rely on a scientific breakthrough to support the company. CBPO is focused on development, production, and manufacture of plasma-based pharmaceutical products in the People's Republic of China. They are the market leader there with sales that grew from $4 million in 2002 to $119 million in 2009. Interestingly, the company says that international competitors Baxter and CSL will have limited opportunities in China in the future as they only have permission to sell Human albumin products. CBPO sells Human Albumin, Human Immunoglobulin for Intravenous Injection, and various hyper-immune products with more products in the pipeline. The blood plasma industry in China is still in the early development stages compared to western counterparts. According to an industry analyst, the growth rate will be 15% to 20% in the industry in China. The company hopes to grow faster than that. The fundamentals for China Biologics look quite solid. The Reuters site has a nice page where you can see how the company stacks up against the industry average and the S&P 500. For the most part, CBPO compares very favorably. From a technical perspective, the stock looks ripe for a bounce. With our valuation measures looking so reasonable, there is no reason the stock couldn't run further. With the company reporting late in earnings season, however, there is a chance that the market will have peaked by then and will be taking all stocks down indiscriminately. Despite how attractive the stock looks to me, investing in individual Chinese small cap stocks is not for the faint of heart. If you're interested in China Biologics, be aware of the risk that accounting standards may not be as robust in China as they are in the U.S. and that the Chinese government has the ability to materially impact the industry in which the company operates. Nevertheless, a small position for a patient investor looks like a reasonable bet. Good news for dividend investors! Weekly Market Update - cracks in the foundation?